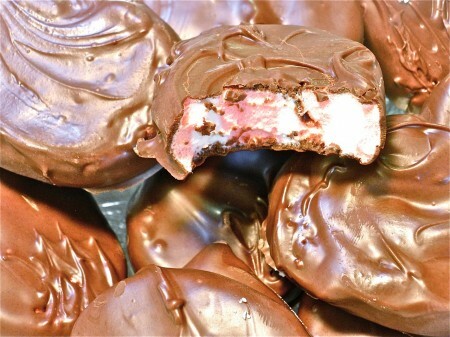 Stop The Cookie Presses for Marshmallow Peppermint Patties! is: Paula Schoenemann!! 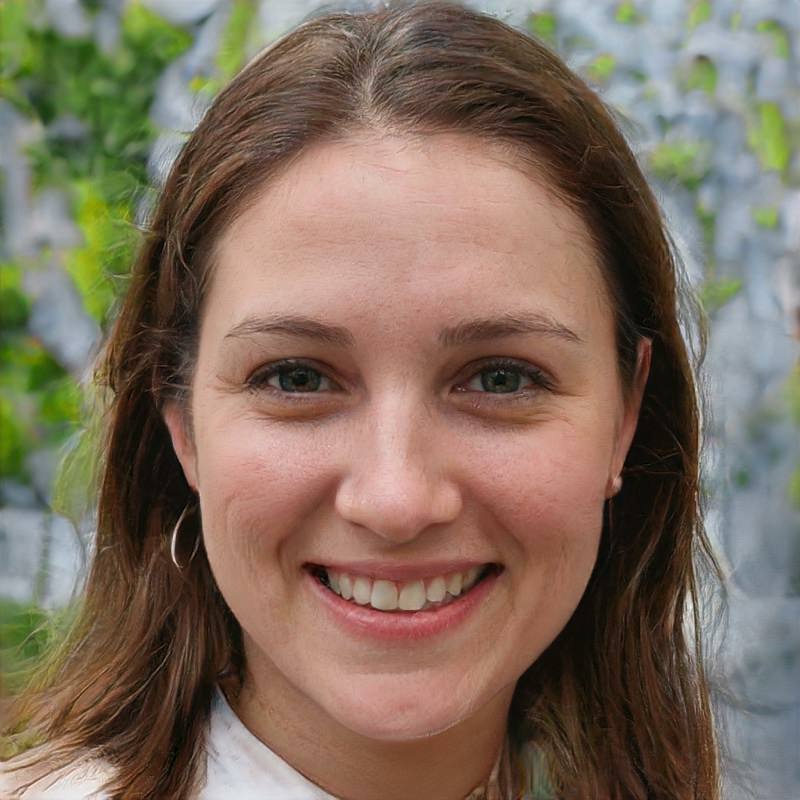 Paula will be receiving vegetarian recipes and memories! — along with a copy of my Walnut Grove Bed and Breakfast cookbook! thank you to everyone who entered the drawing! Next week I will be hosting two more cookbook giveaways before Christmas! I will keep you posted — you just keep entering the drawings! If you want to see where you came in click HERE. 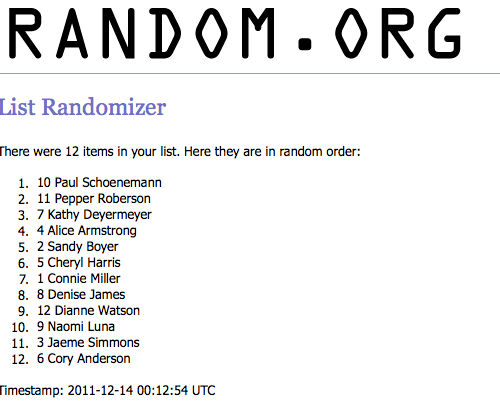 This is a screen shot of the entries. The number directly beside the name is the order the entries were received. The far left number is the number as chosen by Random.Org. Do you remember last week’s excitement when I discovered how to make Sweet & Pink Peppermint Krispie Treats? I have heard from some of you that you did what I did, bought the last of the marshmallows and made these delicious treats for your cookie exchanges and to give to friends and family. Now, I told you I thought the Peppermint Krispies were the best new recipe of the season. While I still think it is pretty awesome, if you are a chocolate-lover at all, or if you live with one (like I do) this just may be the crème de la crème of chocolate candies for the season! 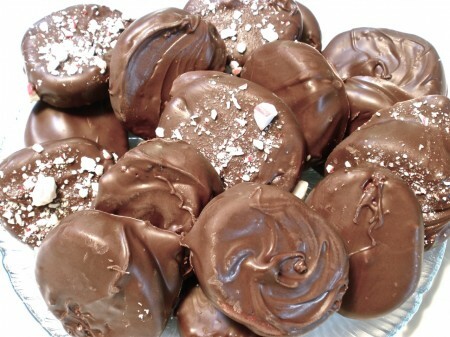 You will need to buy the JUMBO Peppermint Marshmallows, as they are large and oval shaped but not too thick. I melted 1/2 Nestle chocolate chips and 1/2 either white almond bark or chocolate almond bark. Either one of the barks mixed with the Nestle chocolate chips makes a chocolate easy to dip but so rich you may be thinking you are eating dark chocolate. I used two forks and gently held the marshmallow as I dipped and I shook off a little chocolate before laying on tin foil to harden. I put a little crushed peppermint for a “snow on the mountain” look and they too turned out delicious! These marshmallow peppermint patties are so rich and delicious they will top your list of homemade gourmet candies! Combine chocolate chips and chocolate almond bark and microwave for 1 minute. Remove from microwave and stir. Cook on high for another 30 seconds. Do not over cook. 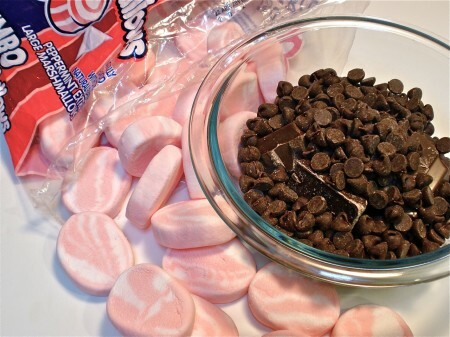 Dip each marshmallow in the melted chocolate. Shake gently and place on foil. Let set for 1 to 2 hours to dry and harden. Share with every chocolate lover you know! When I dip the marshmallows I like to swirl the top instead of leaving it smooth! OK um one of us needs to live closer to the other because your cooking/baking/ etc is AMAZING! My husband said to me after seeing this on FB hey can you make whatever that is your Aunt Catherine just posted? Ha! I will be in search of these marshmallows tomorrow! They really are delicious, hope the marshmallows are available this year. I’m going looking Wednesday! Blessings! Congratulations! We wanted to inform you that this post has been selected as a Featured Archive Post on our site for the first two weeks of December 2012. Catherine, I’m glad you mentioned dipping ingredients. I have been dipping my truffles and other dipped cookies into straight chocolate almond bark. Have been having a difficult time since it’s so thick. I will try your 1/2 choc chips and 1/2 bark idea next. That’s GOT to be better than straight melted bark. Also, regarding dipping, I’ve been using two appetizer forks … the small ones that are only about 6 inches long. They only have three prongs and are vastly easier to handle than a regular fork. I don’t pierce whatever I’ve dipping … I just carefully remove whatever I’m dipping from the bark between the two small forks, gently shake off the excess and place the dipped “whatever” onto waxed paper to cool. Tongs are awful for this process! I like the idea of the appetizer forks — I will try that next time. It is always much better not to pierce what I dipping, but that doesn’t always happen 🙂 Sandy — did you send me the recipe for your truffles? If so, I lost it in my inbox. If not… will you please send at your convenience. I won’t get them made for Christmas, but maybe Valentines! Blessings and happy cooking! OK – how do you dip them? With your fingers-with tongs????? Ah Cheryl, what a good question. I started out using tongs and they slip right through those. So I used two forks, gently sticking the tines of one fork into the pattie about half way. 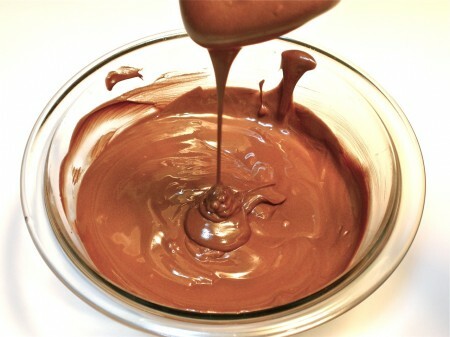 Then, coating well and shaking the chocolate off slightly. Hope this helps! Thanks f0r our goodies. Ms. Alice’s carmel popcorn and your marshmellow peppermint paddies did not last very long. For a dental office, we pride ourself on sampling all the goodies. They were delicious!